Anonymous sale, Stuttgarter Kunstkabinett, 29 May 1959, lot 360. J. Daniel Weitzmann, New York. Private collection, America, by 1978, and thence by descent; sale, Sotheby's, London, 8 February 2005, lot 5. C. Weiler, Alexej von Jawlensky. Der Maler und Mensch, Wiesbaden, 1955, no. 8 (illustrated; titled 'Italienerin' and dated '1906'). C. Weiler, Alexej Jawlensky, Cologne, 1959, no. 25 (illustrated p. 228; titled 'Frauenkopf' and dated '1906'). L.G. Buchheim, Der Blaue Reiter, Feldafing, 1959 (illustrated p. 39). M. Jawlensky, L. Pieroni-Jawlensky & A. Jawlensky, Alexej von Jawlensky. Catalogue Raisonné of the Oil Paintings, 1890 - 1914, vol. I, London, 1991, no. 332 (illustrated p. 281). Bern, Kunsthalle, Alexej von Jawlensky, May - June 1957, no. 8; this exhibition later travelled to Dusseldorf, Kunstverein, September 1957 and Hamburg, Kunstverein, October - November 1957. New York, Leonard Hutton Galleries, Der Blaue Reiter, February - March 1963, no. 77. London, Marlborough Gallery, International Expressionism, Part I, 1968, no. 19 (illustrated). Painted circa 1910, Kopf einer Italienerin mit schwarzem Haar von vorne is a striking colourist depiction of Alexej von Jawlensky's favourite subject-- the human face. This picture is intensely modern in terms of its colours and composition, and yet the poise of the woman and the fact that there are no indicators of the age in which she is living lend the picture a classicism. This in itself introduces a sense of timelessness, of the universal-- this is not, after all, a mere portrait, but is instead an expression of something far more spiritual and profound. The colourism in Kopf einer Italienerin is evident, especially in his use of greens to lend a sense of shadow in the areas of the woman's flesh that are shown. This was perhaps a technique adopted from the French painter Henri Matisse, by whose work Jawlensky was deeply impressed, not least during his own years in France, and whom he met on several occasions. This green is made all the more forceful in Kopf einer Italienerin, by its contrast with the warm reddish tones that have been used to render the main parts of the woman's face. Indeed, the green in particular is reminiscent of Matisse's celebrated portrait of his wife, nick-named La raie verte, precisely because of its prominent use of green. Jawlensky was impressed by the boldness of Matisse's works, and by the intense sense of vitality that his unfettered palette conveyed. Kopf einer Italienerin prefigures, in its intense focus on the face of the woman, Jawlensky's later celebrated series of works on the same subject entitled Heilandsgesicht and Abstrakter Kopf-- these pictures in particular would show a new, almost abstract use of colour and form that moves far beyond Matisse. Separating Kopf einer Italienerin from those later works, is the fact that this picture has clearly not been painted with the almost mantra-like ritualism that creates the codified similarity within those series. Instead, this work is a colourist exploration of an individual, rather than a more generalised notion of the human head as an almost abstract subject matter. 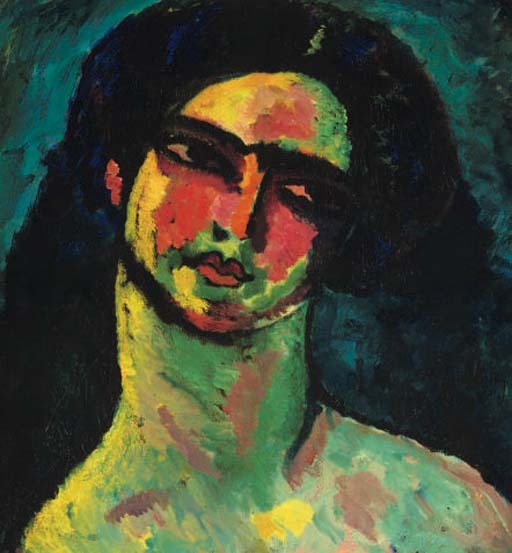 However, Jawlensky can already be seen paring back the subject matter, in order to emphasise the head in a new manner compared to his previous works. He has removed any extraneous details. Gone are the brightly-coloured backgrounds. Likewise, he has discarded the bold hats and other garb that feature in some of the previous works-- not only might they distract the viewer, but such trappings of the world of fashion would have anchored the picture in far too specific a moment, whereas now it becomes as timeless as the human figure. Jawlensky has clearly emphasised the woman alone, and has taken pains to ensure that there is nothing to detract from her. The background has been rendered in tones that are deliberately dark in order to make the skin of her head and shoulders appear to glow upon the canvas, an effect that is heightened by the incandescent reds and yellows that make up some parts of her body. It was in his paintings of heads from this period that Jawlensky made many of his greatest artistic advances, although he continued to paint landscapes in Murnau during the summers of many of the years around the same time, where he holidayed with his friends Wassily Kandinsky and Gabriel Münter. By contrast to the Murnau landscapes, the heads tended to be studio pictures, executed indoors in Munich during the colder months. Yet this was the subject matter that would soon come to dominate his output. This was because, for a variety of reasons and reacting to a number of influences, Jawlensky believed that, 'For me the face is not just a face but the whole universe. In the face the whole universe becomes manifest' (Alexej Jawlensky, quoted in C. Weiler, Jawlensky: Heads, Faces, Meditations, London, 1971, p. 56). This was a belief that was founded in both his spiritual and his aesthetic beliefs. The earliest of these was doubtless the religious art of his native Russia. The use of a painting of a figure as a key, window or gate to a more profound understanding of the world, as a prompt to meditation, relates to the icons, as does the conciseness of the composition in Kopf einer Italienerin. At the same time, Jawlensky was becoming increasingly interested in Theosophy, and was duly exploring a means of inspiring thoughts of the Divine in his art. In this sense, the woman in the painting becomes a form of secular Madonna, hinting at the everyday divinity inherent in the world. The possibility of reconciling the spiritual world with the visual stimuli around us had long fascinated Jawlensky, who had began to perceive a solution after his 1907 meeting with Paul Sérusier who, with his fellow Nabis, had sought to invoke a sense of the soul through many of their paintings. Jawlensky reveals similar interests in Kopf einer Italienerin, as are evident in the thoughtful pose and posture of the woman herself, as well as the sense of aura introduced by the bold colours in which she has been rendered. It is telling that it was during this period that Jawlensky and many of his friends and fellow artists-- including Kandinsky, Kubin and Münter-- founded the short-lived Neue Künstlervereinigung Munich. This was an umbrella-term under which a panoply of very diverse trailblazing artists featured, but two uniting aspects were the liberation of colour and the concept of a mode of pictorial expression that used the visual world as the merest prompts, if at all, to higher thoughts and sensations. While their exhibitions met with an almost universally hostile reaction from the critics and the public alike, one of the few exceptions was Franz Marc, who wrote an impassioned defence inspired by their efforts. Whilst their palettes are completely different, the ensuing friendship between Marc and Jawlensky, resulted in a shared monumentality in their painting, as comparison with the figure in Kopf einer Italienerin and those in Marc's Holzträger, Der Hirte (Knabe mit Lamm) and Aktbild auf Zinnober (Zwei Akte auf Rot), clearly shows.